The spring 2005 OMLA foray was hosted by Jim Toppin and Janet Traub of Lucas County. 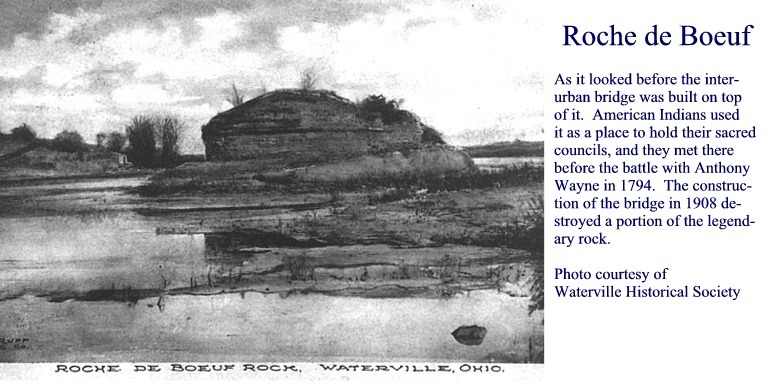 Two sites were visited during this one day foray: Lou Campbell State Nature Preserve and the “Roche de Boeuf” limestone outcrop located in Farnsworth Metropark. Lou Campbell State Nature Preserve covers approximately 170 acres in Springfield Township and includes a diverse mosaic of habitats, including wet sedge meadows, black oak savannahs, and sand barren prairies. Farnsworth Metropark runs along the western shore of the Maumee River and consists of limestone outcrops and talus slopes adjacent to the river channel. The literal translation of Roche de Boeuf is “Rock of Beef,” but it is also referred to locally as “Buffalo Rock.” This outcrop has historic significance as it is known to have been a Native American gathering place and was named by French fur traders in the 1700’s. Lichen biomass and diversity was quite low in the areas sampled during this foray. A total of 28 species were recorded, and many of these were in depauperate condition. The only species commonly encountered at Lou Campbell SNP were those known to be tolerant of excessive nitrogen pollution (Candelaria concolor, Physcia millegrana, Physcia stellaris, and Xanthomndoza sp.). Additionally, the genus Caloplaca was common at Roche de Boeuf. Even though lichen diversity was poor, 9 new Lucas County records were recorded from these two sites. A total of 36 bryophyte species was recorded from Lou Campbell SNP, including 8 county records and one species new to Ohio (Pohlia bulbifera). A preliminary list of bryophytes found at Roche de Boeuf (13 total species), included an additional 6 species new to Lucas County. A full listing of all lichen and moss species encountered during this foray can be found in the June 2005 issue of the OBELISK.